Used for its anti-ageing effects. May reduce symptoms of depression. 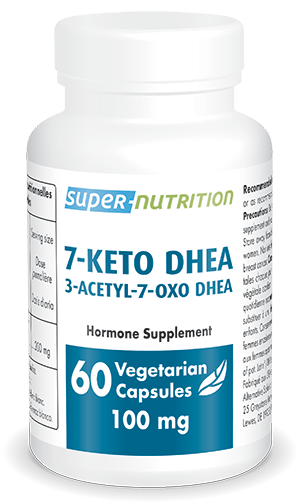 7- Keto™ DHEA is a recently identified natural metabolite of dehydroepiandrosterone which is both more effective and safer than dehydroepiandrosterone because it does not convert itself into testosterone or estrogens in the body. In one word, 7-Keto™ possesses all the advantages of dehydroepiandrosterone with none of the disadvantages. Each vegetarian capsule contains 100 mg of 3-acetyl-7-OXO-DHEA (7-Keto DHEA).